An annual ritual at this time in our house is the printing of the family calendar. This is a homegrown solution as I couldn’t find a simple version for sale. The versions in the shops are very professional, but waste a lot of space on interesting and exciting pictures. With five of us in the family we needed all the space we could get so I wanted a calendar with no pictures. I use an Excel file which has simple settings and can be updated each year. It prints out each month across two A4 pages. There are columns for five people, plus some extra space on the left for general notes and birthdays. The settings are simple – you choose the year and then add in the names you want to appear at the top of each column. The year setting is used in the first column to work out the day of month and the names appear on each month. There is also some conditional formatting which finds the rows that are weekends and makes them tinted. To print, you set the printer to output pages 1-25. This allows for a blank top sheet and then the remaining 12 months display in the correct order. You print this out double sided and then hole punch across the middle of the months. I use some small carabiners to link up the pages. Depending on the thickness of the paper used you may find that you need four holes. 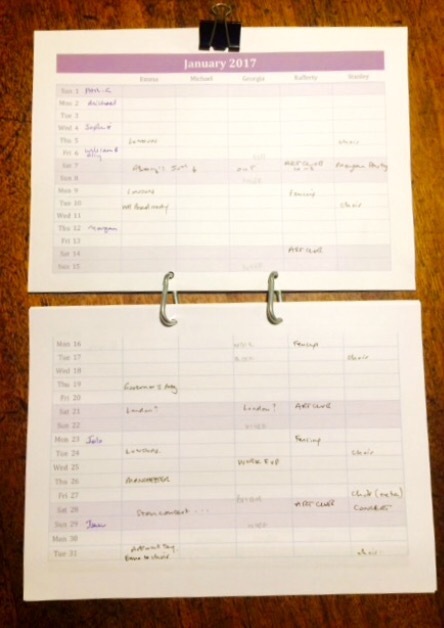 The calendar is finished with a bulldog clip at the top. This allows you to choose the appropriate month for display and hangs onto a nail or screw in the wall. We started using this calendar six years ago. I didn’t create it from scratch, but I can’t remember now how I first made it. It has been developed over the years but some credit needs to go to whoever it was who started this – for example, they worked out the formula for the changing days. Here’s a look at how it works in practice. (Excuse the lack of fidelity in the pic). I thought this might be useful for more than just our family. If it helps you, please link to the page and add a comment.